Possibly Andrea Vendramin, Venice, by 1627. Count Manfred von Ingenheim [b. 1896], Ober-Rengersdorf, Germany; (Duveen Brothers, Inc., London and New York); purchased February 1930 by Andrew W. Mellon, Pittsburgh and Washington, D.C.; deeded 28 December 1934 to The A.W. Mellon Educational and Charitable Trust, Pittsburgh; gift 1937 to NGA. Tancred Borenius, "More about the Andrea Vendramin Collection," Burlington Magazine 9, no. 348 (March 1932): 145, pl. 2A, first suggested that the NGA portrait may be identified with a picture attributed to Bellini in the illustrated inventory of the paintings in the collection of Andrea Vendramin compiled in 1627 (see Tancred Borenius, The Picture Gallery of Andrea Vendramin, London, 1923: pl. 10). Marle, Raimond van. The Development of the Italian Schools of Painting. 19 vols. The Hague, 1923-1938: 17(1935):305, fig. 184. Gronau, Georg. Giovanni Bellini. New York, 1930: 213, fig. 141. Mayer, August L. "Zu den Bildnissen des Gentile Bellini." Pantheon 5 (Jan.-June 1930): 17-22: 22, repro. Venturi, Lionello. Pitture italiane in America. Milan, 1931: pl. 297, note. Berenson, Bernard. Italian Pictures I (1932): 75. Italian ed. (1936): 64. Borenius, Tancred. "More about the Andrea Vendramin Collection." The Burlington Magazine 9, no. 348 (March 1932): 140-145, pl. 2A. Venturi, Lionello. Italian Paintings in America. Translated by Countess van den Heuvel and Charles Marriott. 3 vols. New York and Milan, 1933: 2:pl. 397, note. Dussler, Luitpold. Giovanni Bellini. Frankfurt, 1935: 100-101, 138. Cortissoz, Royal. An Introduction to the Mellon Collection. Boston, 1937: 17. Gamba, Carlo. Giovanni Bellini. Milan, 1937: 85, fig. 78 (French ed. translated by Jean Chuzeville, Paris, 1938: 91, fig. 78). Duveen Brothers. Duveen Pictures in Public Collections of America. New York, 1941: no. 85, repro. Preliminary Catalogue of Paintings and Sculpture. National Gallery of Art, Washington, 1941: 19, no. 29. Book of Illustrations. National Gallery of Art, Washington, 1942: 239, repro. 67. Hendy, Philip and Ludwig Goldscheider. Giovanni Bellini. Oxford and London, 1945: pl. 41. Dussler, Luitpold. Giovanni Bellini. Vienna, 1949: 44, 98, fig. 128. Paintings and Sculpture from the Mellon Collection. National Gallery of Art, Washington, 1949 (reprinted 1953 and 1958): 33, repro. Cairns, Huntington, and John Walker, eds., Great Paintings from the National Gallery of Art. New York, 1952: 52, color repro. Walker, John. National Gallery of Art, Washington. New York, 1956: 24, repro. Berenson, Bernard. Italian Pictures II (Venetian School, 1957): 1: 36, pl. 229. Shapley, Fern Rusk. Comparisons in Art: A Companion to the National Gallery of Art, Washington, DC. London, 1957 (reprinted 1959): pl. 64, note. Pallucchini, Rodolfo. Giovanni Bellini. Milan, 1959; English ed., translated by R. Boothroyd, London, 1962: 92, 150, fig. 171. Heinemann, Giovanni Bellini 1(1962): 76, no. 272; 2(1962): fig. 116; 3(1991): 30, no. 272. Bottari, Stefano. 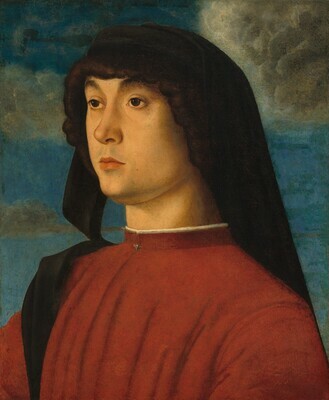 Tutta la pittura di Giovanni Bellini. 2 vols. Milan, 1963: 1:41, pl. 142. Walker, John. National Gallery of Art, Washington, D.C. New York, 1963 (reprinted 1964 in French, German, and Spanish): 302, repro. Cairns, Huntington, and John Walker, eds. A Pageant of Painting from the National Gallery of Art. 2 vols. New York, 1966: 1:150, color repro. Pallucchini, Anna. In National Gallery 1968: 37-38, repro. Shapley, Fern Rusk. Catalogue of the Italian Paintings. 2 vols. Washington, 1979: I:33-34, II:pl. 21. Walker, John. National Gallery of Art, Washington. Rev. ed. New York, 1984: 112, no. 86, color repro. Tempestini, Anchise. Giovanni Bellini: catalogo complete dei dipinti. Florence, 1992: 126-127, no. 40, color repro. Boskovits, Miklós, and David Alan Brown, et al. Italian Paintings of the Fifteenth Century. The Systematic Catalogue of the National Gallery of Art. Washington, D.C., 2003: 52-55, color repro. Giovanni Bellini. Exh. cat. by Mauro Lucco and Giovanni Carlo Federico Villa. Scuderie del Quirinale, Rome, 2008-2009. Milan, 2008: 80, fig. 4, 81.